We made good progress this week on our newly-registered van! Yep, she's now legal and ready for the road. Well, almost ready. We are keenly awaiting delivery of a new door handle assembly. Until that arrives the "new" door, like the old one, is tied closed with a length of plastic-coated wire. It's not an ideal solution and on Wednesday, during the drive into the local VicRoads office, the plastic stretched and the door was opening in transit. Whoops! We had sort-of plans to take the van on her maiden voyage this weekend but will wait till the door is properly secured. I'm not greatly disappointed. There are plenty of other preparations to occupy us - and it will be nice to have them ticked off before we head out of the backyard! I made all the beds yesterday. 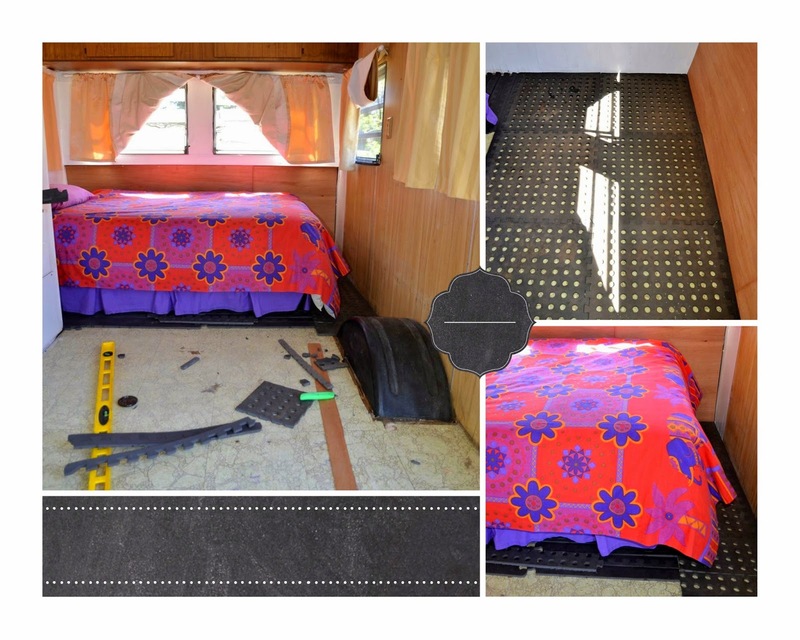 When I finished, I thought of using camping mats on the floor for insulation and improved aesthetics. Shame I didn't have that bright idea before setting up our bed! Anyway, I enlisted Erin's aid today and between us we manoeuvred the bed around the corner and out of the way. Hah - that was a feat (and then shifting it back into place over the mats was even trickier)! At this stage I've just done the back area, mainly under the bed. I used camping mats that were already here and utilised the little-used edges also. I cut two damaged mats to size and think I may have used the six non-matching mats for the larger area. At least that's what I tried to do! I'm pretty pleased with how it is looking so far, though will probably buy some solid mats from Bunnings to finish the remaining area - as they will be easier to sweep over etc. Nick worked on fitting the door properly this afternoon. It isn't quite the same size as the previous one, so the hinges have been moved a little. It's in place now and looks good. 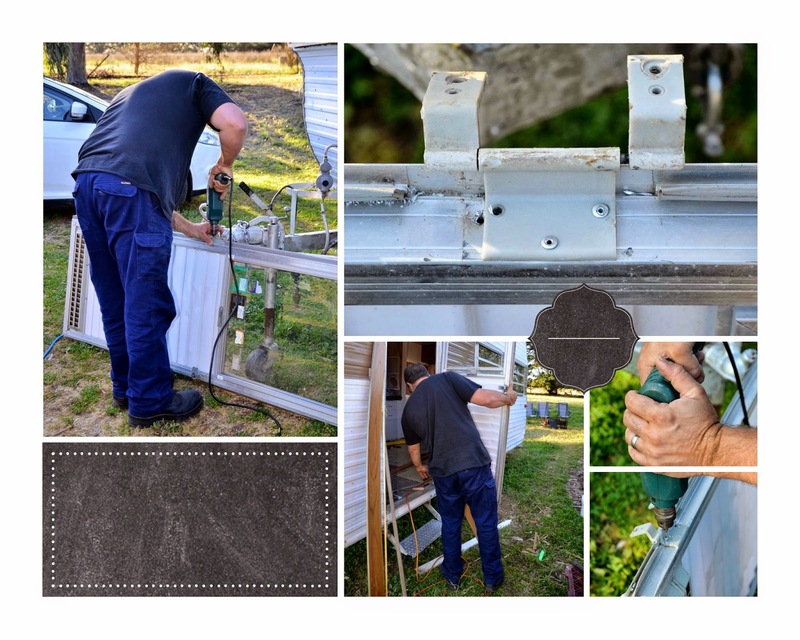 There is a slight gap at the top but that will be easily covered by a piece of aluminium from Bunnings. Nick has plans to strengthen the flyscreen frame - and will then replace the flyscreen. I'll make a curtain, once I work out how to fix it to the door! She's coming up a treat! The mats are a great idea. I was pleasantly surprised by how much better the floor looked where the mats are - cheered it up immensely!